Growing up in a large Italian family in Brooklyn, Michael Amore’s love for food and entertaining was inspired by his father who was a baker. Even as a young boy, Amore knew that he wanted to work with food and people. His childhood passion led him to pursue a degree in Restaurant & Hotel Management. During the course of his studies, he gained experience in a series of restaurant industry jobs—working his way up from busboy to bartender. He launched his career with Marriott Host JFK, accepting a position as the youngest Manager to oversee an entire terminal at the airport. His dream to work in Manhattan became a reality when he was offered the coveted GM position at The Sporting Club—one of the most prestigious star-studded sports restaurants and bars in Manhattan in the 1990s. Amore went on to manage Long Island’s landmark restaurants Café Baci and Café Spasso for almost a decade. 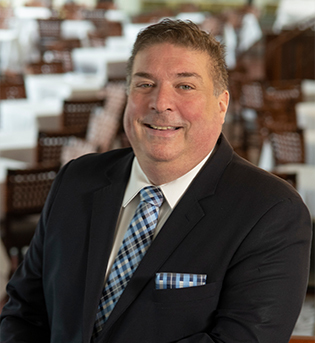 Known for his “devotion to creating the best possible dining experience for each and every diner," Amore was approached by Dean Poll to run Majors Steak House in the 2005 and later become the GM of the acclaimed Riverbay Seafood Bar & Grill. Continuing their successful relationship, Amore is pleased to accept the position of GM at the Central Park Boathouse in New York City.